Below is an article written by historian Professor R. Ian Jack MA, PhD, FRHistS, FRAHS, on the brick drains uncovered in Thompson Square. Professor Jack graduated in Arts from Glasgow University before going on to complete his doctorate at the University of London. In 1965 he became a senior lecturer in the History department of the University of Sydney. In his career he has been President of the Royal Australian Historical Society, been on the Heritage Council of NSW, a member of the History Advisory Panel of the Heritage Council and more recently received an Honorary Fellowship from University of Sydney, recognising his outstanding service. Professor Jack has also authored many books, article and papers on heritage, particularly of the Hawkesbury and Macquarie’s Towns. Please enjoy his article on the remarkable brick drains of Thompson Square. Thompson Square in Windsor is recognised as having very high heritage values. Dating from 1795, it is the oldest civic square in Australia, the centre for government control and economic management in the newly settled area. Adjacent to the early farms which fed early colonial Sydney, its wharfage made it an important entrepôt at the head of Hawkesbury River navigation throughout the nineteenth century. It was named by Governor Macquarie in 1811 in memory of the first emancipist magistrate in Australia. 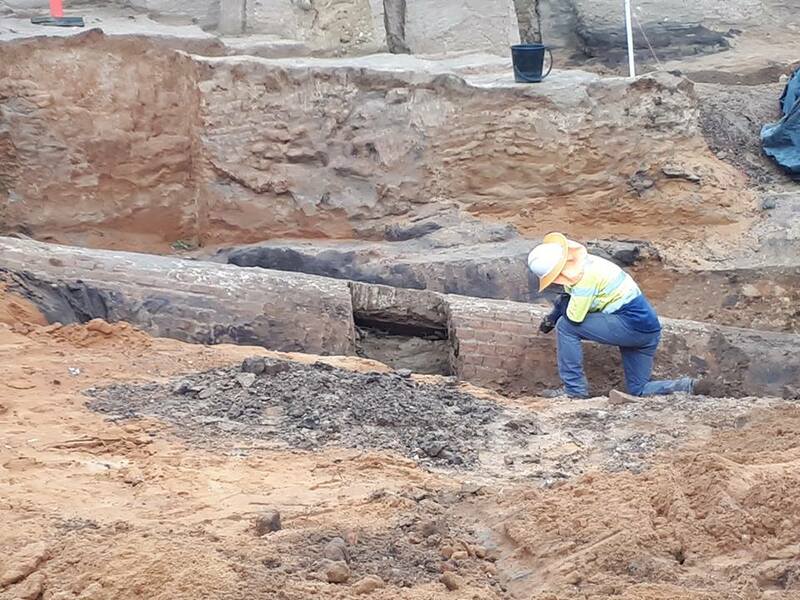 The heritage significance of Thompson Square has in 2018 been dramatically enhanced by the archaeological excavation of its early drainage system. What has been revealed under the surface in the lower part of the square is a complex and sophisticated series of brick drains which can be documented in an exceptionally detailed way. A contract for public works in the square, involving drainage, levelling and wharfage, was issued by Governor Macquarie in 1814 to two prominent, entrepreneurial Hawkesbury men, John Howe (who was the chief constable) and James McGrath. This original document and a related contract made in April 1815, both signed by Macquarie himself, were retained by the Howe family and are now in the State Library of New South Wales. To Sink and Erect one Sewer in the middle of the Square with Channels leading thereto or to Sink and Erect two sewers one on each side of the Square as laid down in the Plan in the possession of His Excellency Governor Macquarie and as His Excellency may please to direct. This plan has not been located, but it is clear from local knowledge and confirmed by the current excavations that in 1814 Howe and McGrath elected to build a single central drain, with ancillary channels. The governor permitted the contractors to manufacture between 120,000 and 150,000 bricks 'on the Brick Ground now making at Windsor for Government’. Since bricks were not relevant to the other works in the contract, this substantial number was earmarked for the drains. By 24 April 1815, the date of the second contract, well ahead of schedule, both the new wharf and the barrel drain had been completed. The new contract gives details of the remaining work. This was the very large enterprise of extending the wharf and reducing the steep angle of the square as it dropped down from George Street to the river. It is this levelling of Thompson Square which explains why the barrel drain was found no less than 3.5 metres under the present surface. It also offers a satisfying interpretation of the archaeologists’ discovery of a series of brick-lined sump-walls going vertically up some two metres from the barrel drain to a brick box drain on the surface. The nature of the bricks found in all three strata is consistent with a Macquarie-period date. Levelling the square was a substantial operation. Although only six months were allowed for completion, the fee was almost double that for stage 1 in 1814-1815 (£600 against £350, plus spirits in each case). The magnitude of the task was recognized by Macquarie, who added to Howe’s copy of the contract a note in his own handwriting, allowing the starting-date for the six months to be postponed for two months until 24 June 1815.
well secured with Land Ties and Caps and planked with sound two inch Planks and not more than six inches wide to be spiked with five inch spikes. It was envisaged that 5,000 such spikes would be needed from government stores. Although the dimensions of the vertical piles were not specified in 1815, the earlier contract had stipulated that each pile should measure between 16 and 18 inches and that the piles should be placed from three to four feet apart. Standing at least three feet above the land-surface, the reinforced landward side of the wharf was a substantial buffer for the weight of the fill required to diminish the slope. Obviously the greatest quantity of fill would be required in the lower part of the square. Howe had already in 1814 and early in 1815 built the large barrel drain just below the original surface. To maintain an efficient drainage system, as the barrel drain was to be covered with a great deal of fill, an additional drainage channel on the surface would be necessary, connected to the barrel drain by a series of brick-lined sumps. The box drain now excavated was therefore added by Howe once the land-fill had altered the landscape of the square, particularly the part closer to the river. Further minor brick drains running to the surface box drain have been identified by the archaeologists. These are the ‘Channels’ stipulated in 1814 but first constructed only after the initial levelling of the square was complete in 1815.
all the planking is carried away and there is no part of the wharf that can be built on again. The 1816 flood would have implications for the new landfill and for the new surface drains. Under the direction of Francis Greenway, Howe and McGrath constructed a third wharf between 1816 and 1820 and it is probable that replacement infill, new box drains and new side-channels were required, with further repairs likely after the 14-metre flood of February 1817 and the 12-metre flood of March 1819 which postponed completion of the new wharf. Howe and McGrath received their final payment for ‘filling in Thompson Square and Erecting a Sewer and laying drains’ only on 15 February 1820. Since 1820, there have, of course, been further changes in the topography and soils of Thompson Square through recurrent floods, the creation of road cuttings to reach Windsor Bridge after 1874 and various uses of the open parts of the square. These have affected the context of the drains, but they do not affect the interpretation. The very precise terms of the contracts make the conclusion inescapable that both the barrel drain and the box drain were conceived and built between 1814 and 1820 as a striking realisation of challenging commissions to two local entrepreneurs. What has been partially uncovered in Thompson Square early in 2018 should be understood as remarkable physical evidence of a complex drainage and land-fill system conceived under Governor Macquarie in 1814 and completed by 1820 through the energy of John Howe and James McGrath. This is the earliest public works of its sort surviving in the colony and the barrel drain is the key element in the sophisticated water management system. There is an overwhelming case for conservation, preservation and display. Renowned archaeologist Edward Higginbotham recently wrote; "The issue with the brick barrel drain at Thompson Square, Windsor is not only its significance, but that it is likely connected to the sites of many of the historical buildings that surrounded the square at a similar date, particularly the Commissariat Store". The above article is shared courtesy of Community Action for Windsor Bridge (CAWB). The State Government and RMS want to demolish the existing, historic Windsor Bridge, and build new three lane bridge in its place - two lanes southbound, one lane northbound. This new bridge will have a high, wide concrete approach road built through Thompson Square, Australia’s oldest public space. (Option 1). The group is fighting to retain the existing bridge and to have a bypass built to take the bulk of the traffic away from the historic town centre. CAWB is a grassroots organisation based in Windsor NSW, the third oldest settlement in Australia. We are dedicated to fighting for the most progressive infrastructure solution for Windsor and the Hawkesbury. The current plan by the RMS, known as Option 1, would see the demolition of the historic Windsor Bridge, the construction of a three lane replacement, and a major, arterial road bulldozed through Thompson Square, Australia’s oldest public space. Not only would this proposal be destructive to the unique and fragile heritage of an important part of our nation's history, it would also prove to be an ineffective solution to the ever increasing demands of road users. Roads and Maritime Services is continuing to work with heritage experts to determine the best way to interpret and document the brick barrel drain in Thompson Square. A spokesperson said Roads and Maritime recently confirmed the brick barrel drain will remain in place in Thompson Square, with a design developed to protect the heritage find. “The NSW Government understands the historic importance of the drain and intends to preserve and protect the drain by leaving it in place and building around it,” the spokesperson said. “The drain is located close to where the southern approach of the new bridge will sit and Roads and Maritime is adjusting the retaining wall design in this area to ensure the brick barrel drain is not affected. 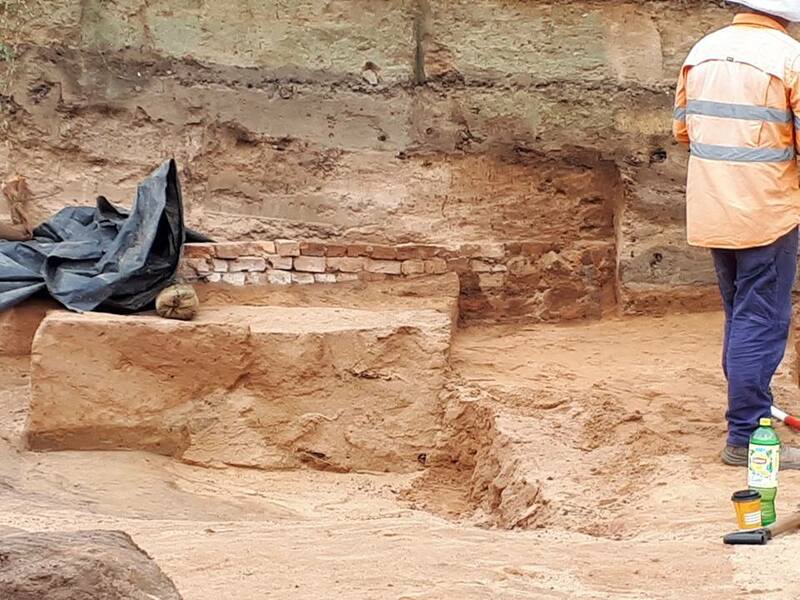 The spokesperson said while this option has been considered, experts in heritage conservation have advised the drain has likely been buried for more than 150 years and believe the drain would further erode and deteriorate if left open to the weather conditions. “A 10 metre section of the drain will also remain buried in the existing parkland of Thompson Square, which could be uncovered and studied if further heritage review is required in the future,” the spokesperson said. “Archaeologists are continuing to analyse, date and catalogue the drain to ensure the history of the region is recorded. The spokesperson said specialist archaeologists are also continuing to carry out investigations to minimise any potential impact to Aboriginal artefacts. “Aboriginal stakeholders are continuing to participate in the salvage work on site to assist with the identification and impact to Aboriginal artefacts,” the spokesperson said. Comments about possible heritage interpretation options can be provided in writing to windsor_bridge@rms.nsw.gov.au. To keep up to date with the Windsor Bridge replacement project visit rms.nsw.gov.au/windsorbridge. John Howe (1774-1852), settler, was possibly born at Redbourn, Hertfordshire, England, the son of John How and his wife Mary, née Roberts. Soundly educated and, by his own statement, brought up to husbandry, he worked in a grocery business in London while waiting for a passage to New South Wales, where he proposed to become a teacher. With his wife Frances, née Ward, and daughter Mary he arrived in the Coromandel I in June 1802, and received a grant of 100 acres (40 ha) at Mulgrave Place on the Hawkesbury River. Another daughter was born aboard the ship and aged six months by the time they disembarked in the colony. Frances died three months later and was buried at Parramatta. Howe married Jane, a daughter of James Raworth Kennedy, at St John's, Parramatta, on 13 May 1811. Encouraged by Macquarie, Howe left Windsor on 24 October 1819 with a party of five white men and two Aboriginals, hoping to discover a trafficable route from the Hawkesbury to the Hunter River. Part of the route had been traversed in 1817 by William Parr and in 1818 by Benjamin Singleton, both of whom set out from the Hawkesbury. It was common knowledge that convicts escaping from the Coal River settlement (Newcastle) made their way overland to the Hawkesbury, but no through road had yet been established. Howe succeeded in reaching the Hunter near Doyle's Creek on 5 November 1819, discovering much fine grazing land, but returned dissatisfied with the route. A second expedition, with thirteen white men and two natives under Howe's command, left Windsor late in February 1820 and, following the expert advice of the native guides, Howe mapped a route which is now the Bulga Road. On 15 March he reached the Hunter River near the present site of Whittingham and followed its course as far as Maitland before returning to the Hawkesbury. Macquarie rewarded him with a licence to graze his flocks on the land he had discovered at St Patrick's Plains, and with a grant of 700 acres (283 ha) later named Redbourneberry which Howe selected near the present site of Singleton. An additional 500-acre (202 ha) grant was made in 1824. Howe left Windsor in 1839 and retired to a small farm, Raworth, near Morpeth, where he remained until his death on 19 December 1852. He was buried in St James's churchyard, Morpeth. His wife Jane died at Warkworth on 1 January 1859, aged 75, survived by seven of their nine children. At Raworth Cottage, Morpeth, on Sunday, the 19th December, John Howe, Esq., aged 78.
to be published for general Information. By Command of His Excellency the Governor, (signed) J. T. Campbell, Secretary. The TRUSTEES of the POLICE FUND in Account Current with D'ARCY WENTWORTH Esq. Accommodation of the Public, that a commodious Ferry should he established across the River Hawkesbury from the Town of Windsor, and the Magistrates in that District having certified their Approbation of the Measure, and of the annexed Rate of Tolls, and submitted the same to the GOVERNOR, HIS EXCELLENCY has been pleaded to sanction the Establishment of such Ferry ; and Mr. John Howe, of Windsor, having provided a Punt for that express Purpose, the following Rate of Tolls, to be demanded and taken by the Owner of the said Punt, is published for general Information, to take Place on the First of November next ensuing. RATE OF TOLLS. £ s. d.
N. B.-The Young of every kind, not weaned, charged at half Price. The GOVERNOR and his Suite, the Magistrates' and Peace Officers of Windsor, and those in the immediate Concerns of Government, are to pass free, and be exempted from the foregoing Tolls. All Persons to pass and repass once on the same Day for one Payment. And it is hereby ordered, that no other Ferry, either by Punt, Boat, or otherwise, shall be suffered to ply within two Miles of the Ferry hereby established at Windsor, either above or below it, on the River Hawkesbury. And in Consideration that all Magistrates, Peace Officers, and other Persons employed on the Government Public Service, as well as the Male and Female Convicts, coming to and going from Church passing the Ferry free, one Government Labourer is to be allowed to Mr. Howe, the Proprietor of the Punt, clothed and victualled from the King's Stores, as a Remuneration for the above Exemptions. And it having also been deemed expedient for the public Accommodation, that a Bridge should be erected over the Chain of Ponds Creek near Windsor, which has accordingly been approved by the Magistrates at Windsor, and sanctioned by HIS EXCELLENCY, and is now established, the following Rates of Tolls to be demanded and taken at that Bridge, are in like Manner published for general Information, to take Place on the First of November next inclusive. The GOVERNOR and his Suite, the Magistrates and Peace Officers of Windsor, and those on Government Public Service are to pass free ; and Tickets to pass Toll free will he granted to such Persons as may pay annually 30s. in Grain, at Government Price. Governor Macquarie from original painting Court House Windsor, Image No. : Government Printing Office 1 - 10712, courtesy the State Library of New South Wales. EBENEZER, PORTLAND, AND WINDSOR PIONEERS. Herewith is a picture of John Kennedy Howe, who was born at Windsor, N.S.W., on April 5th, 1812, and was the first-born of a large family to John Howe and Jane Kennedy, the latter being the second wife of the famous storekeeper, auctioneer and explorer; also ferry-builder over the Haw-kesbury River at Windsor, and founder of Howe's Bridge over South Creek at Windsor. John Howe I. first had a 100-acre grant on the left bank of the Hawkesbury, near Portland Head, which he farmed and where he resided with his wife, Frances Howe, from 1802 until 1810. The first Mrs. Howe is buried on that grant. She bore to John Howe I. two daughters, one named Mary and the other named Eliza. The daughter Mary became in due time a famous Windsor hostess on the old site of the 'Green Dragon' of 1821, the 'Red Lion' of 1835-37 and upwards. In the year 1810, when Andrew Thompson died and was the first body laid to rest in venerated old St. Matthew's churchyard, Windsor, John Howe I. sold his grant, and, being an executor for Thompson's estate, purchased the business of the latter, which Howe conducted for more than 20 years. John Howe later had a farm of 200 acres at Morpeth, where he died in the year 1852. John Kennedy Howe died at 'Redbournebury,' Singleton, on September 4, 1890, aged 78 years. He never married. Mary Howe, the pioneer's eldest daughter (who came with her parents on the 'Coromandel'), was first married to George Loder II., who had accompanied Howe on both his famous overland trips to the Hunter River in the years 1819 and 1820 respectively. Mrs. Mary Loder bore seven children to Mr. G. Loder II., the latter dying on August 13, 1834, just after building the large house in George-street, Windsor (at present owned by Mr. D. Holland, one time Mayor of Windsor), with the Georgeian verandah and the remarkably wide hall that it contains. The front keystone of that house shows the date of the erection of the building (1834). It can he seen from the front by anyone inter- ested. Mrs. Mary Loder married, secondly, Thomas Dargin, son of the original Dargin who was a man-o'-warsman of the Second Fleet. The couple then conducted a business with remarkable success at the old 'Green Dragon' Inn site, until Mr. Dargin's death, when Mrs. Mary Dargin married a third husband, Laban White, an auctioneer, and later Returning Officer for the Parliamentary elections. — WHITE.— September 17 (1882), at her sister's residence (Mrs. George Dight, nee Elizabeth Moore Howe), 'Stafford,' near Singleton (Mrs.), Mary White, in her 84th year. The deceased lady was the eldest daughter of the late Mr. John Howe, of Morpeth, and arrived in New South Wales with her father in 1802. John Howe's second daughter by his first wife, Frances, also married a Dargin. I am of that opinion because in the Kennedy vault in St. Matthew's Church of England cemetery, Windsor, one record states:— Sacred to the memory of Eliza Char-lotte Dargin, who departed this life 13th of June, 1834, aged 33 years. (What was this Dargin's christian name? I would like verification of my surmise from any member of the Dargin family in the Hawkesbury district, or elsewhere, who can fault the accuracy or otherwise of my statement on this matter.) John Howe I. by his second wife, Jane Kennedy, had four sons and five daughters. The sons were respectively named (1) John Kennedy, (2) James, (3) Robert Raworth, (4) Richard Pearce. The latter is buried in the Kennedy vault in St. Matthew's burial ground, Windsor. The daughters were: (1) Elizabeth Moore, who married George Dight; (2) Frances Jane, who married James G. Doyle; (3) Catherine Brough-ton, who married Andrew Doyle; (4) Sophin, first wife of Samuel B. Dight; (5) Emma, second wife of Samuel B. Dight. James Howe, second son of John Howe I., was the only son who married, Anne Dight, a sister of Samuel B. Dight being his bride. This couple had one son, John Hilton Howe by name, who died at the age of 21 years, and with his death the name Howe as a surname; so far as this notable family is concerned, died out. After Mrs. Mary Howe-Loder-Dargin- White died, her body was brought by train to Windsor from Singleton and interred in the Loder family vault at St. Matthew's. One can quite understand with what veneration this famous old place of worship had for her, for without doubt Mary Howe as a girl was an attendant worshipper there. Old Windsorites will be interested to learn that the balconied house in Thompson Square, just below the Royal Hotel, was conducted as an hotel under the name of 'The Lord Nelson' by James Howe (son of John Howe I.) and his wife. That would be during the mid ''thirties' of last century. In Mr. J. C. L. Fitzpatrick's book, 'The Good Old Days of the Hawkesbury,' he refers to 'The Red Lion' in George-street, Windsor, and Mrs. Thomas Dargin (nee Mrs. Mary Howe Loder)—'and a good old lady she was,' he says. But he wrongly refers to her as the mother of all the Dargins, because Thomas Dargin's mother was the first woman in Windsor with that honored name. 1835-37 is the time spoken of by Mr. Fitzpatrick, who also says: 'Dargin's was the scene of many a gay gathering, and as he could spin a good yarn, his house was much frequented. Dargin's 'Red Lion' occupied the place where Dyer's shop now stands' (1900) . This sketch of John Howe's descendants is an outline only. Through his daughters (seven in all) by his two marriages, there have descended some notable people who have pioneered pastoral districts in this State—the Loders, the Dights, the Doyles, and the Dargins-people whose life's careers have been meritorious. The pastoralists bearing those names have in every sense been acquisitions to this State in exploring and taking up 'rough country,' and improving' the breeds of sheep and stock generally. Some of their achievements I shall deal with at length in 'Ebenezer Pioneers of the Hawkesbury,' which is now being gotten into shape. EBENEZER PIONEERS OF THE HAWKESBURY. JOHN HOWE, PIONEER. PATRIOT AND EXPLORER. PART I. Of all the ten free settler families who came by the 'Coromandel,' 1802, with the possible exception of Mr. George Hall, no other pioneer of the old Hawkesbury ever did more by a life's work of achievement, devotion, and duty to this country than did John Howe; and yet Windsor people have not seen fit to honor his name with even so small a matter as that of giving his name to one of its streets! Without a doubt John Howe was the most famous individuality the old Green Hills (Windsor) ever produced. This oversight is the more lamentable when one remembers that Mr. Howe resided there uninterruptedly, with the exception of his two northward from the Hawkesbury exploratory trips of the years 1819 and 1820. He was resident at Windsor from the time of Andrew Thompson's, death (1810) to July, 1839. During all those years Mr. Howe served honorably and faithfully in many official positions, besides that of a storekeeper on his own account in a large way of business. One can fix the exact dates of many things by having the necessary patience to refer to the newspaper files of different epochs. 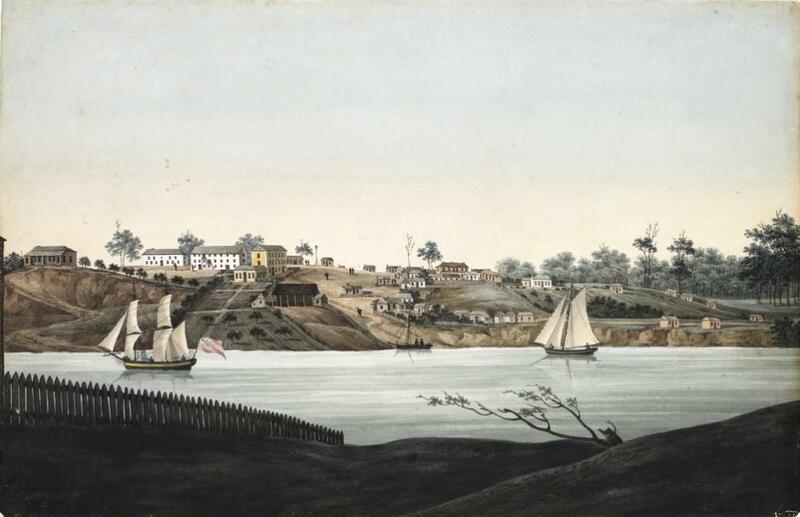 Mr. John Howe appears to have finally left Windsor to reside on his purchased farm of 200 acres at 'Raworth,' between East Maitland and Morpeth, on the Hunter River, about that time (1839). For we find Howe's name as agent at Windsor for the distribution, of the 'Sydney Herald' from its inception on April 18th, 1831 un-til July 12th 1839, when he was succeed-ed by his (to be) son-in-law, Mr. Laban White at Windsor as that paper's agent on July 15th, 1839. All social progress comes by diligent application of labor power to the winning of wealth from the soil. It came to this country by the tireless energy of dauntless men and women pioneers, such as those notables the free pioneer families that came by the 'Coromandel,' 1802— such as those grand people, the Howes, the Halls, the Stubbs and the Johnstons, all of whom contributed very largely to the prosperity, not only of the Hawkesbury alone, but of the whole of the State and the Commonwealth—such as these pioneers who the records show had no previous knowledge of husbandry or farming in the old land — such as these folk we can never honor enough. These large-hearted, free-settler pioneers who cultivated the wilderness, as it must have been in the early part of the nineteenth century. As Anna Shaw sings:— They cut a path through tangled under-wood. Of new conditions, and to broader ways. They hoped to hear their work called brave and good, But, oh! the thorns before the crown of bays. The world gives thwartings to its pioneers, Until the goal is reached— then the cheers! Of the pioneers of land settlement in the early history of New South Wales, no names are due to be writ larger than those of Howe and Hall of the Hawkesbury. What George Hall did for the improvement of Tees Water and Merino sheep, and incidentally the great wool industry of this State, has not yet been chronicled; but in a special article later the deeds and achievements in that direction, also the intense cultivation of the land, by the pioneer George Hall and his descendants, will be written of. In this State's early history the inhabitants were often hard pressed for food supplies; so much so that in the latter part of the reign of Governor Arthur Phillip, also during the administration of the third Governor of New South Wales, Philip Gidley King, to remedy the shortage and the periodic starvation which the people had to endure (two storeships with supplies from England were totally lost off the Cape of Good Hope), the far-seeing and particularly able Governor King sought the help of the Home authorities to seek out people with families with special concessions to those willing to go on the land and become agriculturists, to settle in this State—with the result that ten free-settler families left Deptford on the Thames in the 'Coromandel's' first trip, on February 12th, 1802. Perhaps it would be as well to quote the full list:— Andrew and Mary Beard Johnston, with their children (5)— Thomas, aged 10 years; William, aged 8 years; John, aged 5 years; Alexander, aged 3 years; Abraham, aged 8 months. George and Mary Smith Hall, and their children (4)— Elizabeth, aged 9 years; George, aged 7 years; William, aged 5 years; John, aged 6 months. John and Frances Ward Howe, and daughters (2) — Mary, aged 3 years; Elizabeth Charlotte, born on the 'Coromandel' (1802) aged 6 months on arrival at Sydney. James and Jane Johnston Davison, with their two sons— John, aged 3½ years; James, aged 20 months. William Stubbs and Sarah his wife, with their three children—William, aged 5 years; Sarah, aged 3 years; Elizabeth, aged 12 months. John and Ann Warr Turnbull, and their children (4)— Ralph, aged 10 years; Mary, aged 5 years; James, aged 4 years; Jessica, aged 19 months. James and Susan Skene Mein (no children). He left a widow, but no children. Mrs. Mary Anderson also married a second time, and went to live at Woolloomooloo. I would like to know from any correspondents or readers of the 'Gazette' if they can let me know if Mrs. Mary Anderson (nee Johnstone) left any descendants by her second matrimonial venture, also the surname of her second husband. Mr. John Howe built a substantial house nearer the river, on the portion now occupied by Mr. Marshall Davison. On that grant Mrs. Frances Howe, first wife of John Howe, died, and is interred nearby. Howe appears to have cleared and cultivated much of the land, with the aid of his two assigned Government men, and lived on and worked his Ebenezer grant for at least eight years (1802-1810). As Mr. John Howe was twice married, and many descendants ensued through the daughters by both, wives, it will be necessary to keep strictly to what may appear lengthy in explanation; but important, be-cause some of the first and best pioneer pastoralist families are descended from this worthy man. John Howe was born at Redbourne, Lincolnshire, England, in the year 1774, and was a nephew to the two famous brothers who achieved much for 'Good old England' — the brothers Admiral Lord Howe and Sir William Howe, both distinguished Englishmen in the American War, in the great sea fight against the French off Ushant, on June 1st, 1794. This victory by the English Fleet under Lord Howe is always referred to as 'The Glorious First of June.' Our patriot-pioneer-explorer, John Howe, served with his uncle as a seaman-sailor, and was then only about 20 years of age. (nee Miss Jane Kennedy), the second wife of John Howe. This lady was born at Teston (pronounced Teeson), Kent, Eng-land, year 1787. Died at 'Stafford,' Singleton, January 1st, 1859, aged 72 years. Mrs. Jane Howe was one of the three sisters who accompanied to this country their father, James Raworth Kennedy, the founder of the Australian Kennedys, pastoralists in the Gunning district. Mr. Kennedy and his sister, Elizabeth More Kennedy, who later became the mother of the famous Australian explorer, Hamilton Hume, and Mr. Kennedy's daughters, came as settlers by the storeship 'Sovereign, 5th November, 1795. Of the three girls, Jane Kennedy married John Howe; Eliza Charlotte Kennedy married William Broughton, Deputy Commissary General; Louisa Sophia Kennedy, the youngest daughter, died unmar-ried in the year 1837 at Windsor. A notable tomb is the vault of James Raworth Kennedy, at St. Matthew's churchyard, Windsor. The writer hereby expresses thanks to Miss Eliza J. Garland, of Tamworth, for the loan of hand-painted original daguerreotype portrait. Very good to obtain it considering the lady whose picture it is died in 1859. (nee MARY HOWE), eldest daughter of John Howe by his marriage to Frances Ward. Mary Howe was born in France on the 28th October, 1799, and came with her , parents on 'The Coromandel' 1802. Miss Mary Howe was married three times, firstly to George Loder (II. ), secondly to Thomas Dargin (II), thirdly to Laban White (who himself was previously married). To her first and second hus-bands she bore children, but no children of Laban White. As Mrs. Thomas Dargin (II.) this lady was well and favorably known as an enterprising business woman of ''Early Windsor,' at one time keeping the best- conducted and equipped hotel in Windsor, on the corner of George and Baker streets (on the spot where Mrs. Dyer's business premises were burnt down recently), Mrs. Mary White, formerly Loder and Dargin, died at 'Stafford' Estate, Singleton, at her half-sister's place, Mrs. Elizabeth More Dight's, September 17th, 1882, in her 85th year. Interred in Loder vault, St. Matthew's, Windsor. The writer is indebted to .that dear old lady, the late Mrs. Isabella Loder (nee Wiseman) of Tamworth, for the loan of photo of Mrs. Laban White. Mr. John Weingarth, licensed surveyor, of Sydney, referring to John Howe's 1819 overland trip Northward from Windsor to the Hunter, says:— 'Howe must have had some experience with navigation, otherwise he would not have been able to have taken bearings to prominent mountains' (as shown in the record diary of that trip). In writing of this great pioneer and his life's story, my enthusiasm to chronicle and belaud his efforts makes me remark that Windsor people, in connection with those interested in historical matters of import at Single-ton, Maitland, Morpeth, and other northern towns, should erect a memorial monument to John Howe; the more so as the surname of Howe of the explorers' name is extinct for many years, although through descent from Mr. John Howe's daughters by his two marriages many reputable families survive — just to mention the Dargins, the Dights, the Doyies, the Loders, and in secondary descents the Wisemans and the Dowes—all notable Hawkesbury, New England, Liverpool Plains, and North -Western pioneer pastoral families. JOHN HOWE—PIONEER, PATRIOT AND EXPLORER. PART III. large book could be written of its Founders and its Foundresses, who were imbued with a spirit of piety and thankfulness which was so characteristic of that noble band of North Britons and Border Scotch folk who originated "the little temple in the wilderness"—a chapel in which building all Protestants could assemble for public worship. Many interesting memories of services in connection with the old church are possessed by the surrounding settlers, descendants of the Founders in many instances—records handed down from father to son. The church itself is a very plain structure, unadorned with spire or any other ornamentation, and measures 40 feet by 15 feet, and stands about 11 feet high from the ground to the eaves of the low slated roof, which originally was shingled. There are four windows with small panes of glass on either side of the chapel, the pulpit being at one end, opposite the entrance door, on the upper and outer facade of which is a memorial tablet with names of honor who either took part or lost their lives in the Great War. The old church at Ebenezer is a living emblem of the rugged graciousness of the spirit of its forefathers, and the writer trusts it will always remain so, with due regard for its preservation. Outwardly the walls and roof appear as if they could be strengthened and improved somewhat. It is to be hoped that a permanent fund will be raised for renovation purposes from time to time by the Trustees or Elders of the church, so that Ebenezer Chapel can be kept intact from the elements of Nature and Time's decay, so that Australians a thousand years hence will be able to pil-grimage to this sacred and historic spot. In the years to come Ebenezer Church will be to Australians what Westminster Abbey is regarded in historical perspective to the English-speaking world —"a Shrine of Faith." THE FOUNDERS AND FOUNDRESSES. Of Ebenezer Church, Portland Head, Hawkesbury River (1802). John and Frances Ward Howe, his wife. Owen Cavanough and Margaret, his wife. James Mein and Susannah Skene Mein, his wife. Dr. Thomas Arndell and Elizabeth, his wife. Andrew Johnston and Mary Beard Johnston, his wife. James Davison and Jane Johnston Davison, his wife. John Turnbull and Ann Warr Turnbull, his wife. George Hall and Mary Smith Hall, his wife. John Johnstone and Elizabeth Lewins Johnstone, his wife. Captain John Grono and Elizabeth, his wife. William Stubbs and Sarah, his wife. William Jacklin and Elizabeth, his wife. Paul Bushell and his wife. Lewis Jones. John Suddip. These preceding fifteen surnames, with the nee name of the Founders' life-part-ners given wherever possible, are purpose-ly given so as to go on record as a "kicking-off" point from where future historians can start. Besides the honored fifteen, the following pioneers subscribed to the completion of Ebenezer Chapel :— Thomas Chaseling, of the Lower Hawkesbury—the gentleman buried at St. John's churchyard, Wilberforce. George Thomas Palmer, a brother to Commissary John Palmer, of the First Fleet. James Paynter, a former seaman, and mate with Owen Cavanough on the "Sirius" flagship. Dr. James Mileham, of Windsor. Francis Oakes, of Parramatta. Richard Fitzgerald, of Windsor. William Fitz, of Windsor. Dr. Moore. John Jones. Edward Riley, of "Ralby," near Bringelly. The pioneer, David Dunstan, a carpenter, and founder of the Hawkesbury Dunstans, and in the year 1827 keeper of an inn at Wilberforce, completed the carpentering work at the chapel during the year 1809, the church being opened for divine service about this time. One of the most, interestingly inscribed tombstones at Ebenezer bears the inscription :— Sacred to the memory of WILLIAM JACKLIN, who departed this life January 6th, 1836, Aged 76 years. Alongside is one to the memory of his wife, Elizabeth Jacklin. The "Coromandel" was a very lucky transport, it would appear from reading of her various trips. In the "Sydney Gazette" of May 12th, 1804, appears "Ship News" :— "On Monday (May 6th, 1804) arrived the 'Coromandel' transport (her third trip), Captain Blakey, the former Commander (second trip). Captain Robinson, having died on the voyage off San Salvador. She left England the 4th of December last (1803) in company, with the 'Experiment' transport, which is hourly expected to arrive. The 'Coromandel' brought Ensign Draffin and Creffay with 30 non-commissioned officers and privates of the N.S. Wales Corps, and 200 prisoners. "It was during the administration of Governor King that about a dozen families of free emigrant settlers, chiefly from the Scottish border, arrived in the colony, having been induced to emigrate to New South Wales, on receiving a free passage from Government, with the promise of a grant of one hundred acres of land each on their arrival in the colony, and rations for a certain period afterwards from the King's stores. They arrived in the year 1802. Governor King mustered them on the quarter-deck of their vessel, shortly after their arrival, to ascertain their respective views, resources, and abilities. Observing an old grey-haired man in their number, who acknowledged he had been thirty years in business in London, the Governor exclaim-ed in astonishment, "One foot in the grave and the other out of it, what brought you here, old man ?" It is somewhat remarkable that Governor King himself should have been the first of the two to have both feet in the grave. For many years after the death of the moralising Governor, the old grey-haired man was still alive in the colony, and able to perform frequent journeys on horseback from his farm to Sydney, a distance of forty miles. The free emigrants I have just mentioned were Presbyterians, and settled on farms of a hundred acre each of alluvial land near Portland Head, on the banks of the Hawkesbury. Their settlement was, in these early times, the most exemplary and successful in the colony ; and some of them, or rather their sons, were afterwards among the wealthiest proprietors of the country. One may form some idea of the fertility of the district, from the fact that, from its first settlement in the year 1802, much of the land in cultivation had borne a crop of wheat every year for twenty-five or thirty years in succession, and in many years even a second crop of maize or Indian corn." The "old grey-haired man," whose age the good Governor, King, thought was against him, was John Turnbull (I. ), and the Ebenezer Register records his age at death, on 7th June, 1834, as being 91 years. That would make Pioneer Turnbull 57 years of age on his arrival here. These Scots from the Lowlands of that country must have been hardy and vigorous. Turnbull came from Dumfriesshire. In speaking of Governor King, in looking down the years, one must admit that he was a particularly capable man. Fancy his being Governor of this State at the age of 42 years ! Governor King, like his successor, Bligh, was a Cornishman, being a native of Launceston in that county, where he was born 23rd April, 1758. He became Governor of New South Wales 28th September, 1800, and reigned until 1806, when he returned to England. The worries of administration in N.S. Wales practically killed him at an early age. Here lyeth the Body of PHILIP GIDLEY KING, Captain R.N., and late Governor of His Majesty's Territory of New South Wales. Died September 3rd, 1808. Aged 49 years. Howe was from Flinders County, Lincolnshire, England, although judging from Andrew Thompson's statements when the Scotch Emancipist was near death, Howe knew the Northern Counties and their ports on Tyneside, at Whitehaven in Cumberland. Both had became acquainted years before either had come to Australia. I wish to quote a despatch that Governor King wrote to Lord Hobart, dated Sydney, 23rd July, 1802, in which King says, inter alia :— "The 'Coromandel' arrived here with the convicts in so good a state of health that they were all fit for immediate labor, which reflects the highest credit, on the Master and Surgeon of the ship." There was a slight variation of Governor King's report to the Transport Commission. The Surgeon on that occasion by the "Corodandel" was Mr. Charles Throsby (I. ), founder of the Goulburn family of that name. The latter gentleman ended his life in a very sensational manner in the late twenties of last century. But that is a story of itself. It is as a good citizen of early Windsor that I now wish to say something of John Howe. From a map showing part of the town of Windsor of date about 1835, John Howe and his family of daughters and sons lived on the site in Callaghan-street, towards the river, immediately next to the Royal Hotel, then of course the palatial residential mansion house of Mr. Richard Fitzgerald. The Royal Hotel was built in the year 1826, and for some years after its completion it was leased to the military as an officers' residence and mess barracks. The owner lived next door, in the old cottage in George-street, the bricks of which were the ones condemned by Governor Macquarie as not being fit for use in the construction of St. Matthew's Church. The cottage was built about the year 1817, and is probably the oldest building in the district in, say, an area of five miles of Windsor. The "Blighton Arms" Inn building at Pitt Town is probably the oldest existent place still standing, built by Mr. Henry Fleming, a son-in-law of Mr. George Hall the first. It is much older than the Windsor cottage. The "Blighton Arms" was built in 1807, was closed for many years, then re-opened by Mr. William Johnston (I.) in 1834, as the "Macquarie Arms" Hotel. It is the same place where Alderman G. M. Greenwell, of Windsor Municipal Council, now resides at and possesses. There are orange trees of the Parramatta variety still yielding sweet fruit yearly in front of that historic place. The trees are positively known to be 116 years of age. I thought to bring these facts forward by way of comparisons of ages of ancient buildings of the Hawkesbury towns and original stone structures built by the Ebenezer Pioneers on their holding grants. John Howe, being a Church of England man, held pew No. 19 at St. Matthew's, Windsor, for himself, wife and family. Thus, as the largest merchant storekeeper, and Chief Constable, he set a good example to other folk. The corner site in Windsor, where the massive Burke's Buildings are (now and for years innumerable where Dr. Arnold resides, with the flood waters mark high upon its walls)—those houses have been referred to as "Doctors' Row." Well, that corner was owned by Mr. Cyrus Matthew Doyle, of "Ulinbawn," Sackville Reach, the founder of the Doyle family of pioneer pastoralists. There it was, as recorded in Ebenezer register book, that the marriage took place of "Mr. Andrew Doyle, jun., of Windsor and Portland Head, bachelor, aged 21, and Catherine Broughton Howe, spinster, aged 20." They were married in Windsor by special license on the 22nd day of March, 1837, by John Cleland, officiating minister. The marriage was witnessed, as recorded, by John Howe, of the Parish of St. Matthew, Windsor, and C. M. Doyle, of "Ulinbawn," Parish of Cornelia, these gentlemen being the respective fathers of the bride and bridegroom. Burke's Buildings date from about 1845. Mr. Doyle's original residence was pulled down some time previously. MARRIAGE. By special license, on Wednesday, the 8th inst. (August 8th, 1838), at St. Matthew's Church, Windsor, by the Rev. H. T. Stiles, Mr. Samuel Billingsby Dight, of Richmond and Hunter's River, to Sophia, sixth daughter of Mr. Howe, of Windsor. While Mr. Howe's residence was in Thompson Square, now known as Callaghan-street, Windsor, his large emporium store was situated on what is now the Thompson Square gardens site, facing George-street. This store, which was originally Thompson's, was pulled down, so it is said, about 1829. Mr. Howe then occupied the historic old building once Baker's "Royal Oak" Inn, in Baker-street, the foundations of which can still be seen. In that building John Howe continued the business. A gentleman named Panton was his manager there from 1834 to 1839. Mr. Howe himself led a very active life. He conducted auction sales all over the district, and was always expected to be in readiness to conduct a coronial inquiry concerning deaths or misadventures occurring within a radius of 50 miles. On the site where Howe's store first stood in Thompson Square, we find after its demolition a meeting being called of the inhabitants of Windsor and the adjacent districts, held at the Court House, Windsor, on Monday, 25th November, 1832, for the purpose of taking into consideration the best means of carrying into effect the Proclamation of His Excellency the Governor (Bourke) authorising the establishment of an Annual Fair and Weekly Market in that town. "The first market is to be held on Saturday, the 5th January (1833) at 7 o'clock in the morning in Thompson's Square, and the first Fair on the second Tuesday in June, 1833, when it is anticipated that there will be a full attendance of both buyers and sellers, as there are no fees charged." Some discussion took place as to the propriety of applying to the Governor to alter the day of holding the market from Saturday to Tues-day, and Mr. Beddek, having proposed a resolution to that effect, seconded by Mr. C. M. Doyle, the same was put to the meeting, but a considerable majority were of the opinion Saturday was the best day. Mr. Howe, having handsomely offered to act as clerk of the market gratuitously, his offer was accepted. A committee was afterwards nominated, and a subscription opened, when a considerable sum was collected to-wards defraying the necessary expenses, after which the meeting was dissolved. Throughout the whole of the proceedings the greatest unanimity and good humor prevailed, and everyone seemed impressed with the importance of the objects of the meeting, as well to the town of Windsor and neighboring districts as to the colony in general. John Howe, as the founder of the bridge over South Creek (1813), which long bore his honored name, when some official changed its name to commemorate Governor Fitzroy's visit to Windsor. It was call-ed Fitzroy Bridge. That act was in the spirit of Imperial toadyism, and the Windsor aldermen of to-day might well consider the avisability of restoring its original name of Howe's Bridge. John Howe was the first man to launch a ferry service on the Hawkesbury River, the site of it being where Windsor bridge is to-day. Howe's ferry to the Wilberforce side was running as early as 1812. Mr. John Izzard, Mrs. "Granny" Butler's maternal grandfather, looked after the running of Mr. Howe's ferry or punt for a few years after its inception until about 1820. Mr. Izzard lost his life by drowning in the year 1840, and was interred, with his wife, Ann, in historic St. Matthew's churchyard (Church of England), the old place where Mrs. Butler ("Granny") was baptised as an infant, and where she still attends as often as possible. All wish her many more years of life. In a fourth article I intend to deal with Howe's meritorious and far-reaching exploration—the two Northern trips, 1819 and 1820, with his personal appearance, with his families in descent, and with the social activities of the olden times in Windsor (1810 to 1839). John Howe to an extent had his lines cast in favored places. I shall specially bring these activities forward, so as to contrast with the lives of the folk who founded Ebenezer on the Hawkesbury. JOHN HOWE— PIONEER, PATRIOT AND EXPLORER. PART V.
JOHN HOWE, in the 1819 Journal Diary, wrote a good and descriptive matter-of fact story of every day happenings of that trip, which, of course, does not need sub-editing, with the exception of the spelling of one or two words. His son-in-law, George Loder (II.) desired an exact copy in the handwriting of Mr. Howe, which was made, and that is the duplicate, with the first two pages missing, in the archives of the Mitchell Library, Sydney. It was presented to the trustees by the late Mrs. Isabella Loder, of Tamworth, N.S. Wales, a great grand daughter of the pioneer Howe, who undoubtedly was the first who penetrated and steered a course north-ward from the Hawkesbury into then un-known country. In those days, such, an event was a feat of courage and boldness. Governor Macquarie having placed the charge in one whom he had implicit con-fidence, the results justified his recogn-ition. John Howe having served as a sailor-seaman, with his titled uncles, quite natu-rally he was suited for the purpose. To-day we are heading N.N.E. ½ mile, E. 1-8th mile, E.S.E. 1-8th miles, E. ½ mile, weather fine, scrub thick in places, creek made at sundown, range breaks off here, bearing, E.S.E. ½ mile, N.N.E. ½ mile, N. 1 mile, a rock on the East side of the river, and high land nearly a mile, grad-ually sloping to the river." In speaking of the 1819 Diary of John Howe, I wish it to be understood that the pioneer also kept a daily record journal of the 1820 exploratory trip. There was only one (the original) in this instance. It was in the possession of the late John Richard Dight, eldest son of the late S. B. Dight. Mr. James C. Dight, a grandson of the pioneer and still living; at Burwood, Sydney, being in his 83rd year, often perused the 1820 Diary, and distinctly remembers its different rendition compared with the former Journal. Mr. Dight's brother, however, kept it, for the purpose of making a copy, to a man interested in historical matters living at Cessnock, N.S. Wales, and never afterwards recovered possession of it. It is known to be in the hands of a man living near West Maitland, who on occasions as suits him quotes extracts from it for newspaper purposes. Such a priceless heirloom which really belongs to the Dight family through descent from Miss Sophia Howe, if it can be recovered, should be placed in the Mitchell Library. So far as I know, the 1820 trip of Howe has not yet been printed in ex tenso. I here wish to correct one or two errors made by people who should have known better, notably in 'Early Days of Windsor by Rev. James Steele. On page 138, inter alia, he says, referring to John Howe: 'Howe's Bridge (South Creek bridge, as it is called at present) was built by him over the South Creek (Windsor), and he (meaning Howe) was a relative of Robert Howe, printer, of the 'Sydney Gazette'.'' While not particularly wishing to knock hard the assertions made by some historians whose researches were extremely superficial, I wish to deny the allegation, as it is a lie in toto. George Howe, the editor and founder of Australia's first newspaper (his son was Robert Howe) was a Creole from St. Kitts' or other West Indian Islands, and had black blood in his veins, as has been testified over and over again, in the early history of this State. John Howe was an Englishman, and came from a naval family. The great Earl Howe, the Admiral who defeated the French off Ushant on the 'Glorious First of June,' likewise the Earl's brother, Sir William Howe, who served in the American war, were his paternal uncles. Another assertion, made by Mr. Robert McMillan ('Gossip') and written in all seriousness, was that when Howe, Singleton and party discovered the Hunter River district they had almost perished when young Archie Bell (meaning Archibald Bell (II.) obit 9th August, 1883, aged 80 years), discovered them on Patrick's Plains, and were just in time to save their lives' (meaning Howe's party). The statement of Mr. McMillan must refer to the 1820 trip, be- cause Benjamin Singleton did not go on the occasion of the 1819 trip, and there is no mention of famishment for provisions in the Journal of the first trip. Such untruths are not history, but defamation on leadership. John Howe was not the man to undertake an expedition without knowing his men and having sufficient provisions to last the time likely for it to take. It would appear evident that 'Gossip' got mixed with his names, confusing Howe for Pike — the notorious Captain W. F. Pike, of evil memory of later years, the predecessor occupier of 'Pickering' Estate, near Denman, N.S. Wales. So Bell succored Pike's party, not Howe's. In passing, it may be said that 'Pickering' was once a penal settlement, and was a very large estate, containing some 10,000 acres of land, and was also once possessed by Captain Ogilvy, another taskmaster, whose doings were prominently brought into the limelight in later years. For those who desire more information re the early land grantees of the Lower and Upper Hunter, let me refer them to J. T. Ryan's ('Toby' Ryan's) 'Reminiscences of Australia,' a valuable book—even though in places at times 'Toby' 'draws the long bow,' and he therefore must not be taken too literally in everything he writes of. John Howe moved from Windsor to 'Ra-worth Farm,' Morpeth, in 1839, on to the 200 acres of land acquired from James Griffiths. '200 acres, Township of Morpeth, 30th June, 1823, quit rent commencing 30th June, 1828. Conditions— Reserving right to use of all timber suitable for road or military purposes. Grantee to procure to be assigned to him 2 convicts to be used solely on the grant. When the, writer saw these 200 acres during the year 1918 there was not a native tree at all on the place. The land was entirely under lucerne crops for dairying purpurposes. When John Howe went, to ''Raworth Farm," he appears to have stayed there for the remainder of his life. During his lifetime the same social activities and family unities existed as they formerly did at old Windsor. SUMNER—WARD.—By special license, on the 9th instant (9th March, 1847) at 'Raworth Cottage' Morpeth,' Edward Sumner, of Wondobar, Liverpool Plains, to Emma Ward, late of Lincolnshire, England, and niece of Mr Howe, of Morpeth. Married—On Wednesday, the 23rd instant (June 23rd, 1841) at St. James' Church, Morpeth, by the Rev. G. K. Rusden, M.A., George Dight, Esq., of 'Stafford Place,' Darlington (Singleton), son of the late John Dight, Esq., Coroner for Richmond, to Elizabeth Moore Howe, fifth and youngest daughter of Mr. and Mrs. Howe, of Morpeth, but late of Windsor. The late James H. Doyle, the once well- known pastoralist, who lived at 'Invermein house,' Scone, was a son of Mrs. Catherine Broughton Howe, his father being Andrew Doyle, a pastoralist pioneer of the Namoi river, where Mr. Doyle took up Narrabri or Cooma station as it is generally known. Mr. Doyle, jun., was born at 'Raworth Farm' on the 3rd of May, 1844. This gentleman was interested all his life in station properties, and pioneered the Bokhara River at Bundabulla, which was held by his parents also. Mr. James George Dight, happily still with us as the last surviving grandson of John Howe, and living at 'Wairoa,' Want-street, Burwood, told me that he just remembered his grandfather as an old man, and never saw a photo-picture of him. Mr. James G. Dight was born also at 'Raworth Farm,' in the year 1841, and is the second son of Mr. S. B. Dight, whose own property was 'Clifford' Estate, near Singleton, and many other stations in the north-west of this State. The extensive number of descendants through marriages of John Howe's seven daughters is too lengthy to enumerate, in a short resume of Howe's life, but will be dealt with in another series dealing with 'Pioneer Pastor-alists of N.S. Wales, and their Achievements.' I am here reminded to say that there appears to be only one person who vividly described John Howe to me, as his personal-is of import. That one is Mrs. Emma M. Butler, now in her 89th year (born 1835). This old lady, who still lives at Windsor, describes John Howe as a typical 'John Bull' in physical make-up. Mrs. Butler remembers seeing Mr. Howe often in Windsor. On the last occasion she was 8 years of age, when she saw him in the main street at Singleton, in the year 1843 (where she was with her parents). Mrs. Butler describes the pioneer as above medium height, large shoulders, with a thick bull-neck, and extremely large, full, round eyes. One seeing those eyes could not easily forget them—she says. When visiting Morpeth I saw a number of old people and asked many old residents in full and active mental capacities did they remember John Howe, and was told by many that they did. In fact, a Mrs. Jory, who lived with her son on portion of 'Raworth Farm,' a lady then over 80 years of age, said her late husband helped to construct the vault for the body of John Howe, at St. James' churchyard, Morpeth; and Mrs. Jory verified all what Mrs. Butler told me. I asked her to describe Mr. Howe, which she did. Then there were Mrs. Towns, Mrs. Brookes, Mrs. Stevens, and a Mr. Ebenezer Ling, all of Raworth or Morpeth. I also saw a Mrs. Jones, sen., of High-street, Morpeth; All of these knew Howe in life. One of the parties said that the historic picture of Hendrik Hudson, as seen in the painting, would do well for a picture of John Howe. The engraving is that of Henry Hudson, the English navigator, being cast adrift in the large bay or sea named after Hudson. Hudson is there depicted with large, owl-like eyes, holding a chronometer or some such instrument in his hands in a whale boat. The engraving is to be seen in a 'Sydney Mail'' issue for the year 1882. I will conclude this series with the family tree in descent from John Howe and his first and second wives. Children of John and Frances Howe (nee Ward):— Mary Howe, born 1799 in France, became successively Mrs. George Loder (II. ), Mrs. Thomas Dargin (II. ), lastly (thirdly) Mrs. Laban White. Mr. White was previously married. No children born to Mrs. Laban White by her last marriage. To George Loder (II.) born 1796, died 1834, aged 38 years, Mrs. Mary Howe Loder bore the following seven children to Mr Loder: — (1) Mary Loder, born 1816, who became firstly Mrs. John Wiseman, secondly Mrs. Thomas Chaseling (of Pitt Town), died June 5th, 1875, aged 59 years, buried in St. Matthew's churchyard, Windsor, as (Mrs.) Mary Chaseling. (2) Jane Loder, married Thomas Wiseman, of Laguna, Wollombi, to whom she bore nine children, the youngest being Isabella, afterwards Mrs. George Loder IV. ), buried in Tamworth C. of E. cemetery. (3) George Thomas Loder (Captain Loder), born 1823 at Portland Head Farm, Hawkesbury River, who married Sarah Ire- land. This George Loder (III.) died at Singleton in 1901, aged 78 years. He had two sons, George (IV. ), a surveyor, and St. Thomas Loder, a pastoralist. Isabella Wiseman married her first cousin, George Loder (IV. ), surveyor. Mrs. Isabella Loder died at Tamworth, July 25th, 1922. (4) An-drew Loder, born 1825, married Elizabeth Evans (no children), died 1900, aged 75 years, buried at St. Matthew's C.E. ceme-tery, Windsor. He was a well-known rac- ing man and pastoralist. (5) Sarah Loder married Dr. Joshua Dowe (seven children) buried at Tamworth, along with her hus-band. (6) James Mein Loder, born 1830, married to Sarah Cullen, who bore six chil-dren in all. Died 1870, aged 40 years, buried in St. Matthew's C.E. cemetery, Windsor. (7) Another infant named George, who died as a baby. Mrs. Mary Howe-Loder-Dargin bore one son to Thomas Dargin (II. ), John Wiseman Dargin. The second daughter of John and Frances Ward Howe was named Eliza Charlotte Howe, and was born on board the 'Coromandel' (1802) and married Thomas Dargin (II.). The latter was born in 1800, and died at Windsor in the year 1843, aged 43 years. On his first wife's death he married the wife of his deceased brother-in-law, George Loder (II.). Or, written another way, Thomas Dargin (II.) married his deceased wife's sister, Mrs. George Loder (II. ), after Loder's death in 1834. To Thomas Dargin (II.) Eliza Charlotte Howe bore 5 children in all, the names of some being: — Frances Dargin, who became Mrs. James Lawry Oakes, secondly Mrs. Cowan. Sophia Dargin who became Mrs. W. G. Burgiss. An-other was Thomas Dargin (III. ), born 1826, who was a butcher in Windsor, and died in 1859, aged 33 years, under peculiar circumstances. Mrs. Eliza Charlotte Dargin lies in the Kennedy vault in St. Matthew's Anglican churchyard. Windsor, dying at the early age of 33 years, on 13th June, 1834. Come we now to the children of John Howe and his second wife, Mrs. Jane Kennedy Howe-nine in all. The first was a son named John Kennedy Howe, born at Windsor, April 5th, 1812, died at 'Redbourneberry,' Singleton, September 4th, 1890, aged 78 years. J. K. Howe never married. Second son, James Howe, born at Windsor, June 14th, 1813, died November 9th, 1861, aged 48 years; married Miss Anne Dight, a daughter of John Dight (I.) of Richmond. The issue were a son and a daughter. An advertisement in the 'S.M. Herald' of Saturday, December 10th, 1870 reads: — 'Death. — On the 2nd inst. (December 2nd, 1870) of colonial fever, at Tam-worth, John Hilton Howe, aged 18 years, and son of the late James Howe, Esq. of Singleton. With his death the male line descent of the Hawkesbury Howes ceased. No son of John Howe, with the exception of James, ever married. The daughter's marriage is chronicled thus in 'S.M. Herald' of Saturday, June 24th, 1871:—'Marriage.— Mackay—Howe.— On the 15th instant (June 15th, 1871), at St. Peter's Church, Tarnwin- gee (Victoria), by the Venerable Arch-deacon Tucker, D.D., assisted by the Rev. Charles P. Greene, George Edward, eldest son of the late George Edward Mackay, M.D., of 'The Grange,', Tarrawingee, Victoria, to Jane Frances, only daughter of the late James Howe, of 'Pelerin,' Single-ton.' (One notices to what a remarkable ex-tent the Christian names, both male and female, are perpetuated in the old families. In a sense it is a very good old custom, but causes a lot of confusion.) The third son of John Howe was named Robert Raworth Howe, born at Windsor on August 21st, 1821. He never, married. R. R. Howe died at Carroll, of apoplexy on December 22nd, 1859, aged 38 years, deeply regretted by all who knew him. The fourth son of John Howe was Richard Pearce Howe, born at Windsor, 1826, and died there at the age of 10 years (1836). Now we come to the daughters of the second marriage of John Howe and Jane Kennedy Howe. The eldest girl was named Frances Jane, who was born at Windsor in 1814, later marrying James G. Doyle, of 'Dargle Farm' and 'Ulinbawn,' Hawkesbury River. This couple had a very large family. Mr. J. G.
Doyle died at His residence, 'Osterley House,' or 'Park,' Hinton, Hunter River, on 11th September, 1878, aged 67 years. These Doyles' children were the pioneers of pastoralist families of the name in the Brewarrina district, and the creeks and Barwon River generally. Mrs. Frances J. Howe Doyle died at her daughter's residence, Trafalgar street, Annandale, on De-cember 3rd, 1890, aged 76 years, and is buried at Rookwood. The second daughter, Emma Howe, was born at Windsor in 1816. This lady became, on the death of her sister Sophia, the second wife of Samuel Billingsley Dight; of 'Clifford' estate, Singleton, and bore the son named Samuel (II.) to Mr. S. B. Dight. Mrs. Emma Howe Dight, died February 22, 1885, aged 69 years, and is buried in the Dight vault at 'Clifford,' Singleton. Samuel Billingsley Dight died August 7th, 1888, aged 73 years. The third daughter of John, and Jane Kennedy Howe was Catherine Broughton Howe born at Windsor 1817, marrying An-drew Doyle, junior (II) of "Ulinbawn," Sackville, in the year 1837. This couple also had a large family. The late John Henry Doyle, previously referred to, was a son. Miss Catherine Broughton Doyle, a Church of England Deaconess at Orange, N S Wales, is a daughter. Another daughter is Mrs. Laban Wiseman, of 'Brush-grove,' Uralla. Mrs. C. B.Howe Doyle died in the year 1857. The fourth daughter of John Howe was Sophia Howe, born at Windsor in 1820. She was the first wife of Samuel B. Dight This lady died at the very early age of 30 years, on February 5th, 1850. She bore a family of five children— four sons and one daughter, whose names were in the order named:-John Richard, James George, Charles, and Robert, and daughter Elizabeth born 1846— all deceased except Mr. James G. Dight, of Burwood, who, as before stated, is in his 83rd year. The fifth daughter of John and Mrs. Howe was Elizabeth Moore Howe, born at Windsor 1824. She married George Dight, the issue being four sons and three daughters. Mr Dight died 26th February, 1851, and is buried in the Dight vault at St. Peter's Anglican churchyard, Richmond. Mrs. E. M. Dight lived for many years at 'Stafford House,' Singleton, later living at Burwood, Sydney at a house named also 'Stafford,' where a daughter, Miss Sarah Dight, a lady advanced in years, still lives. Mrs. E. M. Howe Dight died on 5th January, 1908, having reached the goodly age of 84 years, and is buried at Rookwood. "The last of that bright band." Sacred To the Memory of JOHN HOWE, Who Departed this Life the 19th Decr., 1852, Aged 78 years. Also to the Memory of RICHARD HOWE DIGHT, who died 16th Sept., 1859, Aged 15 years. Mr. Reeve is an enthusiastic student of early colonial history, and takes great pains to obtain accurate and authentic information. His book will bear the title 'Ebenezer Pioneers of the Hawkesbury,' and will be illustrated. He will deal with the nine pioneers who came out with the 'Coromandel' in the year 1802, and their descendants. Hitherto no Australian writer has done justice to these brave and hardy pioneers, who 'made two grains of wheat grow or two cobs of corn nourish where none grew before.' In giving the life history of these nine men, and also the work of their des-cendants, Mr. Reeve will include Owen Cavanough, originally a seaman on the 'Sirius,' flagship of the First Fleet, because of his worthiness, and also because he was actually the first pioneer at Ebenezer, the proof of which can be found in the fact that his son, Owen Cavanough II, was born there in the year 1799, as shown in the family records. The colonial grants of the nine others commenced in the year 1803. We give a list of the pioneers that will be dealt with in Mr. Reeve's book:— ANDREW JOHNSTON. GEORGE HALL. JOHN JOHNSTON. JOHN HOWE. JAMES DAVISON. JAMES MEIN. ANDREW MEIN. WILLIAM STUBBS. JOHN TURNBULL. OWEN CAVANOUGH. Ralph Turnbull, son of John Turnbull, will also be dealt with. Owen Cavanough was buried in St. Thomas' cemetery, Sack-ville, in the year 1841. His son, Owen Cav-anough II, was grandfather of Miss Fanny Taylor, Matron of the Home for Infirm, Windsor. As stated above, he was born at Ebenezer in the year 1799, and died at Sack-ville July 29th, 1885, aged 86 years. The very fact that Owen Cavanough II was born at Ebenezer proves that the original Owen Cavanough and his wife were settled at Portland Head at least fully three years previous to the arrival of the 'emigrants from the Scottish Border.' As a matter of fact, John Turnbull was the only Scotsman among them—he came from Annan, Dum- frieshire, Scotland. Mr. Reeve's book will be a tribute to these men of the early days who braved many dangers and did much for this country, and whose good works have had butscant recognition. None of our historians have yet dealt with them as Mr. Reeve in-tends to, and his book will be of absorbing interest to the people of the Hawkesbury, and a valuable addition to our historical records. Many of the names given above are familiar names along the Hawkesbury River to-day, for descendants of some of those grand old pioneers are still with us. With this article we print a photo of Owen Cavanough II, supplied to us by Mr. Reeve. The block was made from a photo kindly lent him by the grand-daughter, Miss. FannyTaylor, to whom he expresses thanks.